This Alva Day image titled "Bingen" was taken at high water in late May 1928. You can also see White Salmon up on the hill. Picture taken from above Koburg Beach? I don't know if it is my eyes or 17 inch laptop, but I don't see a steel power tower. Where is it? I think it is right next to the water. Looking at the original scan, there is definitely a tower on the WA side at the waters edge, and another one on top of Stanley Rock. My recollection is they were built with Condit Dam around 1914, but it would take some research to verify. I know flood waters have reached the Gorge Heritage Museum in Bingen, but, I don't know what year. 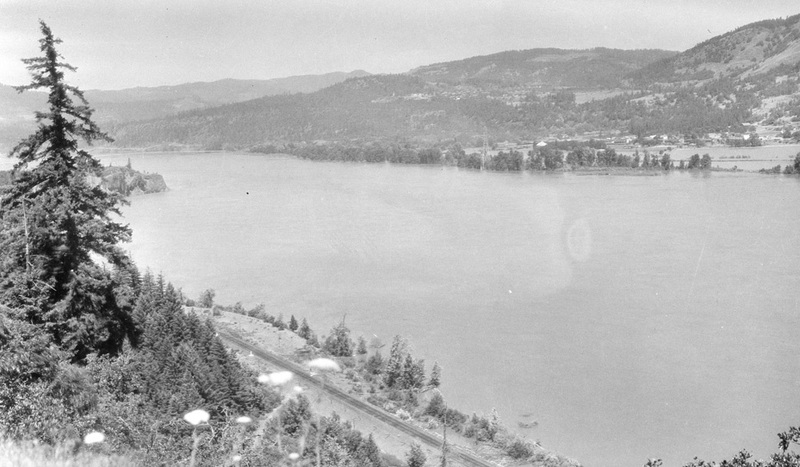 In early January,1917 PP&L announced a $30,000 project to connect Oregon and Washington power generating facilities. The tower atop Stanley Rock carried nearly two miles of cable to make the connection. The project was completed in April, 1918.